Portfolio Management selects the most appropriate ideas & products from the strategy, and then undertakes a selection process to pick the best to deliver into service. It is at the tipping point of demand and supply and it’s customer is the vision. Project scope and targets are delivered from a Portfolio Selection process, that filters opportunities, as it passes along a criteria filled conveyor belt. It picks the right items, in all shapes and sizes, feeding the engagement stage of the project delivery. The process oversees and controls selection, balances demand and supply to choose the scope and project target. This is a key step on the journey, planning to deliver each product at the right time, cost and quality, to deliver the right benefits, whilst managing associated risks. As with many processes, the weakness is often at the interfaces, between different management teams. Portfolio management is a co-ordination process, that frequently manages the strategy and provides the fulcrum between Board and Project teams. The success of portfolio management is dependent on bringing teams together. It removes areas of uncertainty or weakness, which undermine the whole process. Create a process to adjust parameters (costs, risks, skills etc) against the baseline demand. Progress in terms of net benefits and progress. Develop or review Governance as required. As the scope is defined each of the selected projects has a viable business case, which will be refined and baselined, before starting project engagement. a resourcing policy that assesses competency internally as a measure of team’s performance and feeds into an estimating model. baselining metrics and a mechanism to aggregate progress against the plan and strategy (e.g earned value). A selection process (including weightings against criteria) that all parties approve. Portfolio selection operates as a structured think tank. You set up a tool that contains the ideas, outline business case and products with predefined criteria. profit margin, risk, safety and criteria that are less obvious, such as environmental benefit, disability impact. Agile focused organisations, will use a simple Portfolio prioritisation selection process that will detail what we MUST, SHOULD, COULD, WONT DO (MOSCOW) do. Either way, the criteria are designed to select the right ideas at the right time. Often the criteria are weighted, usually towards the profit margin. The team will typically replay the filtering exercise that you have been through, to justify internal governance. Project team will start to produce outline business cases that will support the project scope and Portfolio selection starts. The Board wants reports, from the start, with timescales, risks – including views and facts on feasibility. Identify unresolved gaps, from the capacity and capability assessment covering the next 3 to 5 years, so that peaks and troughs can be identified well in advance. Capacity and capability planning will measure current demand needed and supply of resources available across IT, and different business segments. Understand any existing gap between demand and supply and compromise through prioritisation. Deciding what to leave for now is the nub of portfolio selection. Assess the risks that need to be mitigated or accepted towards setting an appropriate contingency and project targets. Allocate Portfolio supply resource and availability by skill/capability. 3 Categorise the ideas by domain, so targets are aligned with possible solution ideas. 4 Prioritise the importance of the items, in terms of criteria like: risk, short / long term solution, domain (s)…Once scored, selection is based on weightings agreed at the outset. 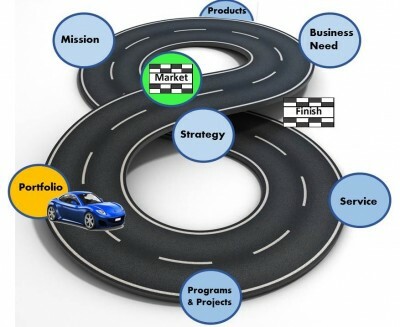 5 Balance the supply solution (scope, resources, timings for roadmap, benefits…) against the demand strategy targets and roadmap. Timing of the deliverables ie can service management cope with the deliverables? In practice, for any snapshot in time, the portfolio will have many ideas, projects and programmes at different stages of maturity (in flight and planned). If a product is not meeting its KPI. Problems are analysed to require a change in the product. Change is agreed and the scope of the work included in the portfolio and prioritised. The project to deliver the improved product into transition should improve the KPI in service. Such a cyclical loop is the foundation of project and service based businesses. The process has a self monitoring correction and improvement cycle. This is just another way of looking at the figure of 8, where KPI failures in service are reprioritised in the Portfolio and improved through new projects.